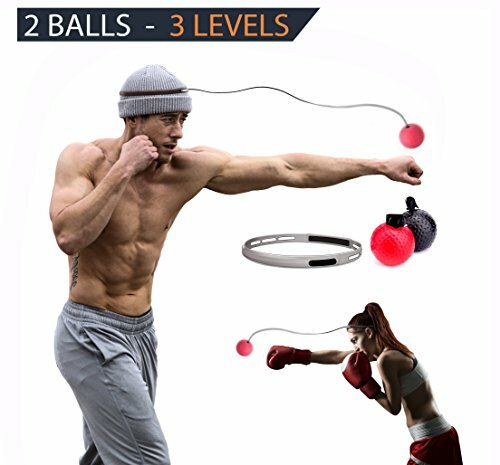 BV Reflex Punching Ball | Ideal Punching Speed Traning Ball for Self Defence Boxing MMA UFC and Other Combat Sports | 2 Different Ball - 3 Different Difficulty Level for Imporving Dodge Focus & Reflex by BV Company at fittherapist.com. Hurry! Limited time offer. Offer valid only while supplies last. Many professional boxing fighters are using the Reflex Boxing Ball to train their hand-eye coordination, improve their speed, reflex, and agility. Many professional boxing fighters are using the Reflex Boxing Ball to train their hand-eye coordination, improve their speed, reflex, and agility. Such as Vasyl Lomachenko – WBO super featherweight boxer. His training clip using tennis ball hat on Youtube is very famous. But you don't have to be a professional boxer to use a Boxing Reflex Ball. It's a perfect equipment for everyone to practice punching skills. You don't have to go to a gym, just strap the headband on and have fun with it. Once you start training with the ball, you will find it very funny and effective. 15-20 minutes of training every day will help you improve your skills, burn your fat and get fit. 1. A new learner should start training with the RED BALL, it may hit your face but it will never hurt. 2. If you want to test your ability with the BLACK BALL, slow down punching speed to avoid the ball rebounding to your face when hitting. 3. Once the rebound has the trend to your face, grab the rope can change the direction of the ball. 4. When you are training, attention should be focused. look out the rebound to avoid injuries! ✅ IMPROVE YOUR SPEED, REFLEX & DODGE ABILITY: You don't have to be a professional boxer to use fight ball, the punching ball is a perfect training equipment which is 360 degrees all-round blow and reflex quickly to improve your sharp reflex, hand-eye coordination and speed. You can use it to train, improve your skill, release stress or have fun with it!!! ✅ LIGHTWEIGHT AND PORTABLE: Total weight of the item is only 0.25 lbs lightweight. No matter where you are, you can play this boxing reflex ball whenever you are free. You don't have to go to a gym, just strap the headband on, have fun, improve your skill and burn your body fat within 15-20 minutes! Perfect for home workout or even for the beach and the park, this punching ball equipment will definitely burn a lot of calories and help you get fit! ✅ SAFETY FIRST: We add 2 balls for you, BLACK and RED. The BLACK punching ball is so soft and squishy. We specifically designed it to be much lighter and softer than the tennis ball, it's perfect for a beginner. The ball may hit your face but it never hurt. Made by the harmless soft material, it will help you to improve the eye-hand coordination, accuracy,...**THE RED BALL IS NOT FOR NOVICES** you should ONLY use the RED BALL once you could dominate the red ball and your skill is better. ✅ LIFETIME GUARANTEE - Workout with your brand new BV Reflex Punching Ball for, and if you are not 100% satisfied with it - Just send it back for a full refund at any time! Our goal is to take your workout to the next level. What are you waiting for? Click on "Add to Cart" right now! If you have any questions about this product by BV Company, contact us by completing and submitting the form below. If you are looking for a specif part number, please include it with your message.